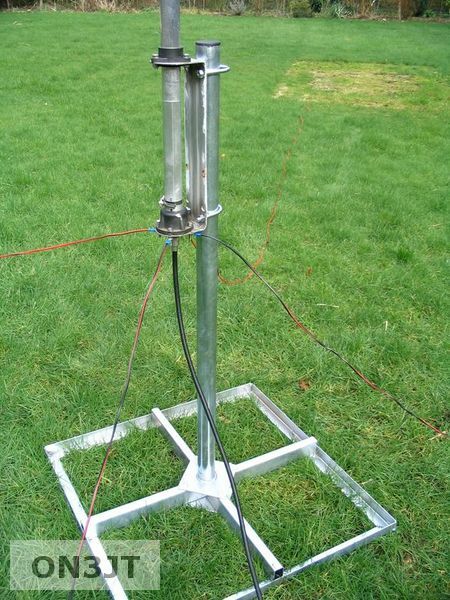 First I tried to build a Cobwebb antenna. It is a small antenna and rather easy to build. I used cheap fishing rods, costing 4 to 5 euro each, from a known sports hardware shop. The funny thing was when I asked the sales person if the rods contain carbon fibers he mentioned that I’m not the first asking. He says = “Some people use them to make antennas…”. Big smile when I replied to do the same. Bought speakerwire and started cutting and soldering. Finally the first dipole was attached to the big cross. Added in total 4 dipoles when I wanted to test it. It was a small disapointment. Only 400 kHz usable bandwidth on 10m. The 12m and 17m were usable. But 15m also lacked the necessary bandwidth. That, the mechanical instability and difficulties in triming each band was enough to stop this project. 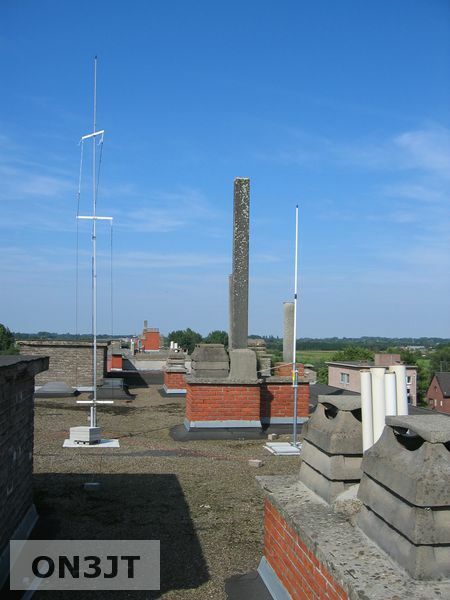 The next antenna built was a so called Fan Dipole antenna. 5 Wires parallel for each band, fed by a balun at the common center. I started with 10cm between each dipole. But the interaction between each element made it also difficult to tune. I figured out that I needed at least 15 cm between each element, the more the better. But also here not enough bandwidth on 10m. 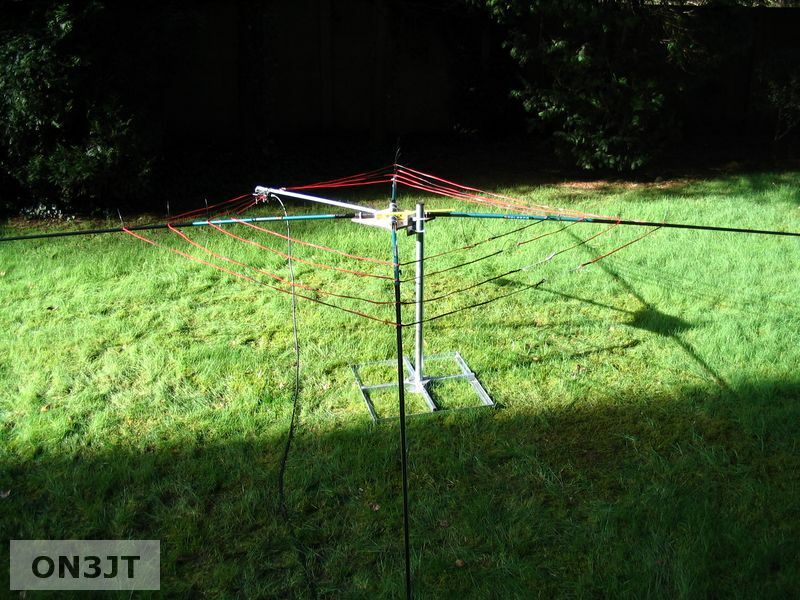 The test setup was a bit changed to a 4 band dipole with 1 inverted V for 10m, turned 90 degrees from the fan dipole. See the pictures. This works, but the weight of the balun and the span of the whole thing decided me to go for something else. But when finishing the antenna a few weeks later I noticed that I couldn’t find the resonance point back. After hours of examening, testing, unscrewing, other bolts I found the “problem”. 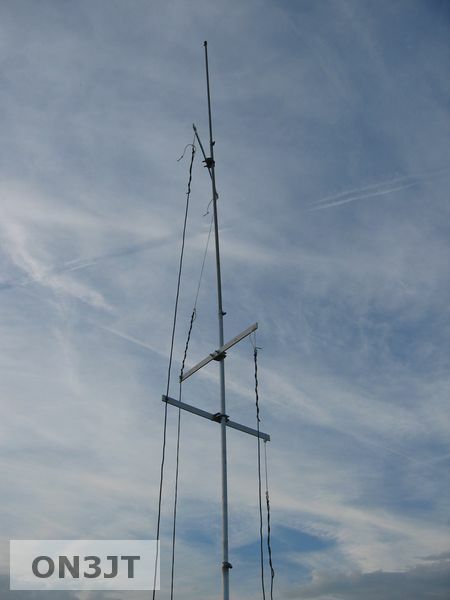 The antenna itself was mounted on a sat mount, 1m AGL. 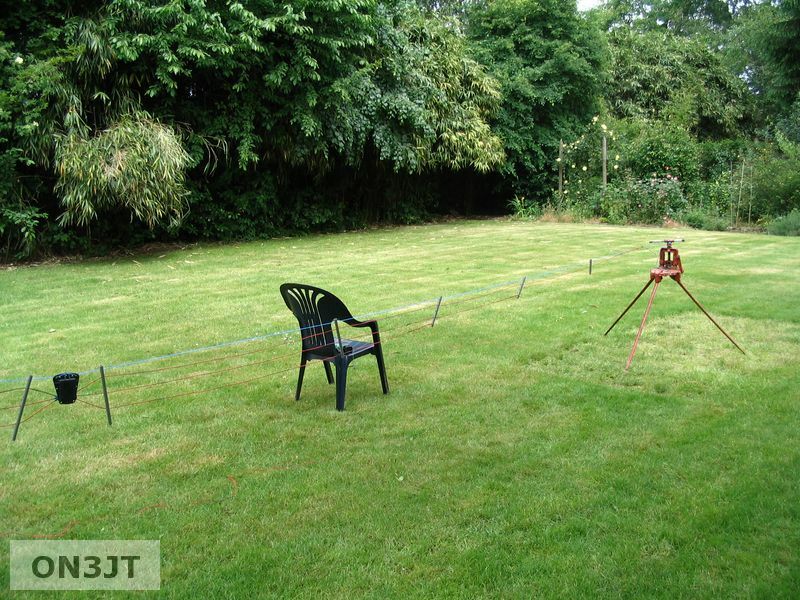 The radials were lying on the lawn. Elevated the radials with 1 meter so that the angle with the radiator was 90 degrees solved the problem. 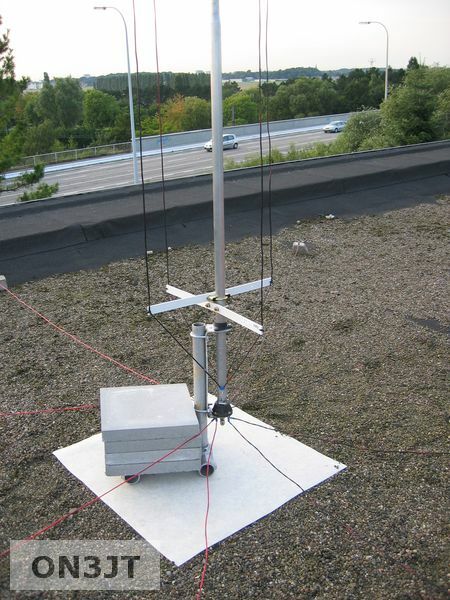 Why not use more than one radiating element like a fan dipole ? Searching the net for more info gave me lots of info about open sleeve antennas, close coupling and so on. There was a site grounding the other elements. The antenna looked like a small V. But not worked for me from the first time. I cut 4 elements each a 1/4 wave at its band. Attached plastic spreaders to the CB antenna and hung up the 4 other bands. Drilled a hole nearly at the bottom of the antenna and connected all elements together. Look at the picture for more details. Still using the 4 radials of 5,2m (1/4 wave on 20m) the antenna was not usable. By accident I noticed when I rearranged the radials to a 1/8 wave on 20m everything worked. 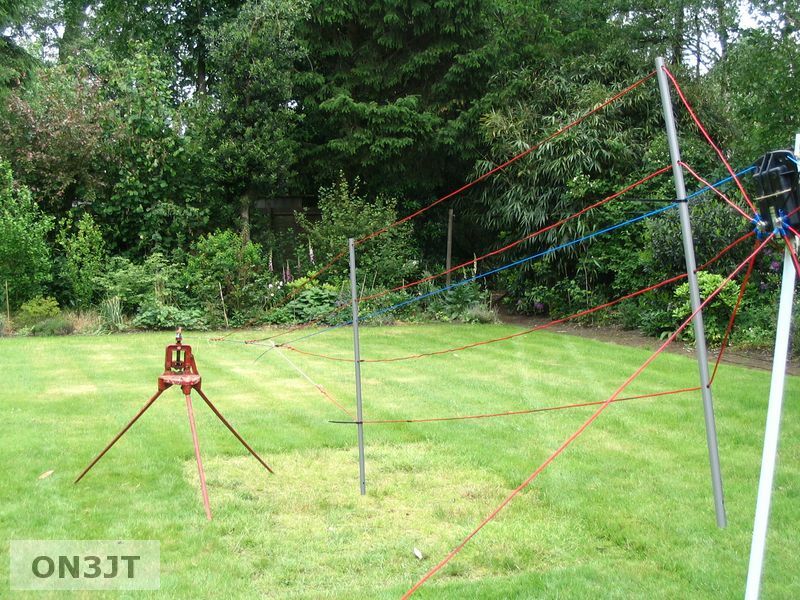 Instead of 4 radials of 5,2 m I now have 8 radials of 2,5 m.
So now I have 5 band vertical HF antenna without lossy traps, stubs, loading coils, …. A 1/4 wave on each band that already survived two small storms. Ok, it tipped over but no harm done. This entry was posted on Tuesday, April 22nd, 2008 at 19:32 and is filed under Antennas. You can follow any responses to this entry through the RSS 2.0 feed. Responses are currently closed, but you can trackback from your own site.